The responsibility of overseeing an entire video conferencing environment can be overwhelming. You’ve got to make sure your video technology is working, and quality is maintained across hundreds or thousands of calls simultaneously. Now, if you have a single vendor solution, your success is being hindered by complex data and reporting. Meanwhile, multiple vendor environments mean you’re trying to work with fragmented – everything. It’s like you need superpowers to keep on top of endpoint and infrastructure performance, creating reports, budgeting and responding to those support tickets that just-keep-stacking up. Lucky for you, Vyopta has a better way. 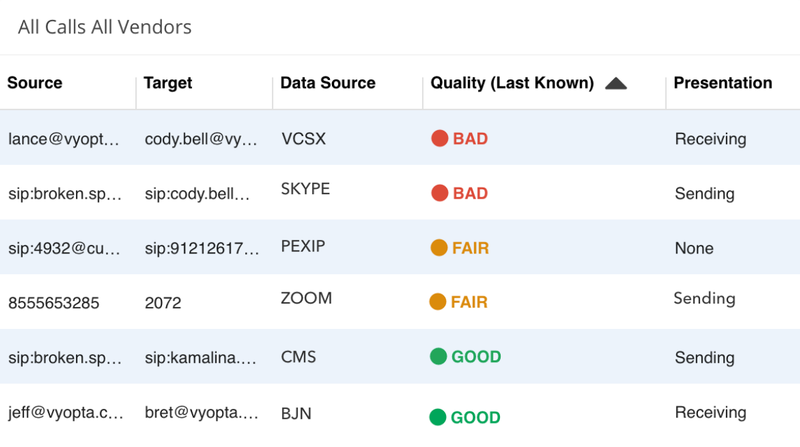 With Vyopta, you’ll have complete visibility into your video network. You’ll get the answers you need from our simple interface and quickly generate meaningful reports. You can stop being reactive with better real-time monitoring. Identify and diagnose issues before they happen by having deeper insights call quality, device status, and capacity. Plus, with our custom alerts system, your team will always be in the know, and that support queue will stop exploding. But, if a ticket does come through, you can troubleshoot effectively. We store data for years, so you can diagnose past issues, and keep improving over time. Vyopta allows you to make data-driven decisions so you can better optimize existing resources. By analyzing data trends for employee adoption, capacity, and utilization down to the hour, our clients have reported 6 figure savings in a few short months. By leveraging these metrics, you can finally stop sweating about over or under buying on video endpoints, infrastructure, capacity, and licenses. So, no more complexity , trips to spreadsheet hell, or need for super powers. Vyopta will help you easily get more from video conferencing and collaboration.